Symptoms of Vitamin D deficiency are VERY subtle. 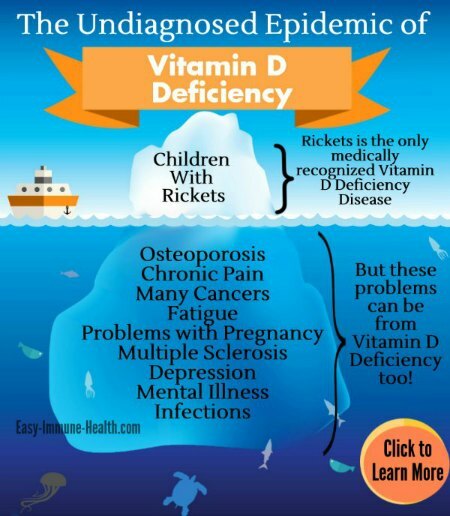 Learn the Symptoms of Vitamin D Deficiency Before it's Too Late! So what are the symptoms of Vitamin D deficiency? Well there are two levels of Vitamin D deficiency, also called Hypovitaminosis D, that current Vitamin D Research is now beginning to show. There is severe Vitamin D deficiency and a less obvious problem of Low Vitamin D. The problem here is that most people who have Low Vitamin D may be suffering from the severe effects of this problem, but they may not even know it! Severe Vitamin D deficiency in children causes them to get the bowed legs, and sometimes arms, that are characteristic of the soft bone disease of rickets. In adults, this severe form of low Vitamin D causes a disease called osteomalacia, and can be a precursor to osteoporosis. Osteomalacia is similar to rickets, as it is a softening of the bones, but it doesn’t lead to bowed legs as it does in children. Instead, it leads to the bone pain and muscle pain and weakness that are almost universal complaints in those who have chronic health problems. And since these complaints are so common, that they are often overlooked by doctors or misdiagnosed as Early Symptoms of Fibromyalgia. standard practice in clinical care." Read that again "...should be standard practice" - yet it is not. 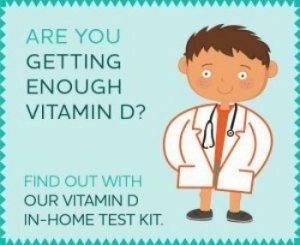 If you have pain of any type that is caused by ANY reason- even if you think you already 'know' why you are having pain or it seems completely unrelated to vitamin d- insist on having your Vitamin D Level checked against the 'normal' level as per the current Vitamin D research as outlined on the Normal Vitamin D Level page. Do NOT usethe lab reference values as the 'normal' range as they are likely to be outdated. And Not Even Know it? Vitamin D Research is finding that Low Vitamin D is a VERYwidespread problem that has a lot of serious consequences of which we are just beginning to understand. While these are complicated diseases and there are obviously other factors involved in any individual’s risk, it’s true that a common risk factor for each and every one of these diseases is a Low Vitamin D level!! While the Low Vitamin D levels found in these diseases doesn’t necessarily mean that they CAUSE these diseases, it begs the question of what the relationship is. Remember that on the Vitamin D Factspage, we discussed the potent Immune System stimulation that Vitamin D is responsible for. Since the above diseases (and really ALL diseases) are related to an inappropriate, inadequate or downright failed immune response – you can start to see that these diseases really could be just symptoms of Vitamin D deficiency. Interestingly, the percentage of people with hypovitaminosis D may even be severely UNDERESTIMATED in these studies. The blood levels that were used as a cut off point for determining who wasVitamin D deficient were often MUCH lower than what is currently accepted as a ‘normal Vitamin D level’ in vitamin d therapy. Sunshine Mist Vitamin D Spray- This Vitamin D3 is GREAT for kids. Just a spray a day is all it takes. The Vitamin D Solution: A 3-Step Strategy to Cure Our Most Common Health Problem- Take a look at this EYE OPENING book. This fascinating account of the health benefits of Vitamin D will keep you turning pages far into the night! Vitamin D Therapy What About Vitamin D Toxicity? Causes of Vitamin D Deficiency? Click below to see already answered questions about Vitamin D deficiency symptoms. Could My Proximal Muscle Weakness Be a Result of Very Low Vitamin D Levels? Could Numbness be connected to Vitamin D deficiency? Can Vitamin D help with Reoccuring Colds? What are the neurological effects of Vitamin D Deficiency? Are there neurological symptoms of Vitamin D deficiency? Is Low Vitamin D Asymptomatic? Can Vitamin D deficiency really cause all this? Severe nerve problems and seizures from low vitamin d? 6th Cranial Nerve Palsy...Vitamin D Deficiency? Can Vitamin D Deficiency cause Petechiae in an adult? Does vitamin d deficiency contribute to eye condition called Pinguecula? How long could I have been vitamin d deficient? Can Vitamin D Deficiency make you feel like warmed over death? Do you know of any research linking Vit D deficiency and scoliosis? Thanks. Dr. Stuart Porter, D.O. Can a Vitamin D Deficiency Cause Mouth Problems? More symptoms of Vitamin D Deficiency? Can Vitamin D Deficiency Cause Balance Problems? Is it Vit D Deficiency or Hypoglycemia? I have been diagnosed with vitamin D deficiency. Can that cause shortness of breath and fatigue? What is the connection with vitamin d and PCOS? Does vitamin D deficiency cause depression?